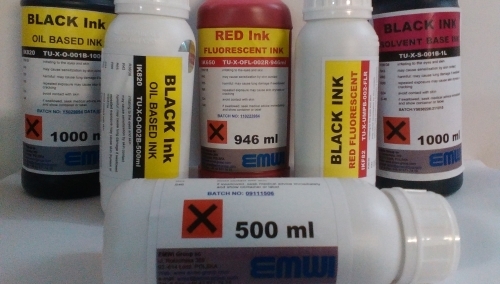 The EMWI industrial and security inks for inkjet printing are original manufactured inks proven for best quality, longest durability and shelf life, lowest printer maintenance, long-lasting printing results and security effects. The inks for Xaar printers are oil based, solvent based, UV curing, various spot visible colours. Among the security features: long-lasting fluorescence under UV for red visible and "unique" for black visible colour. The inks for HP printers are water based, solvent based, UV curing, pigmented or dye spot colours. Among the security features: long-lasting fluorescence under UV for visible colours and invisible and MICR. The inks are packed in cartridges, bulks and bottles belonging to their characteristics and final use. Special vacuum process for HP cartridges. All our inks and packings are originals and officially approved for industrial uses. Sorry we do not have any refurbished, refilled packing and not original ink! 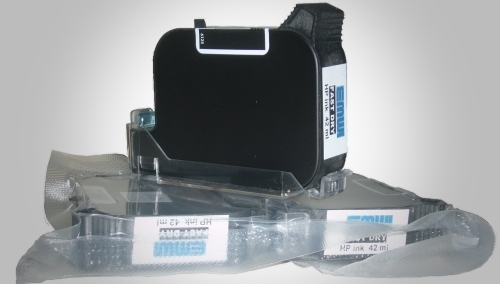 Multiple tickets and labels numbering and barcoding (including PVC). Single tickets, labels numbering and barcoding (including PVC). Envelopes, leaflets and reviews complete personalisation and mailing. Security Tax Stamps sheets numbering and barcoding (including 2D). Security Lotteries Tickets sheets full variable data and images personalisation. Highest quality, longest shelf life and printing durability. Universally approved for HP and Xaar technology printers. Easiest cleaning and maintenance by original flushing solutions. No production stops for missing or defective prints. Direct Warranty from manufacturer or OEM partner.